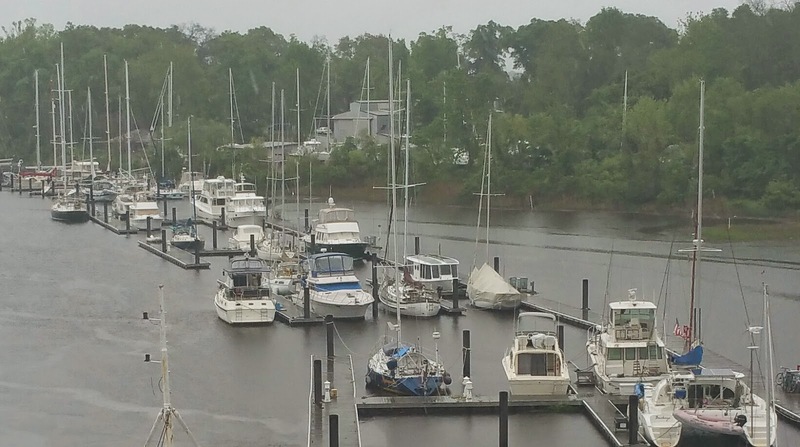 Can you find the 40 foot MOG solar boat in the rain? 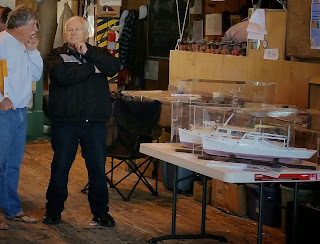 As written in the April 13, 2015 blog entry, a few boat shows in April and May would kick off the MOG getting some water moving under the skegs. 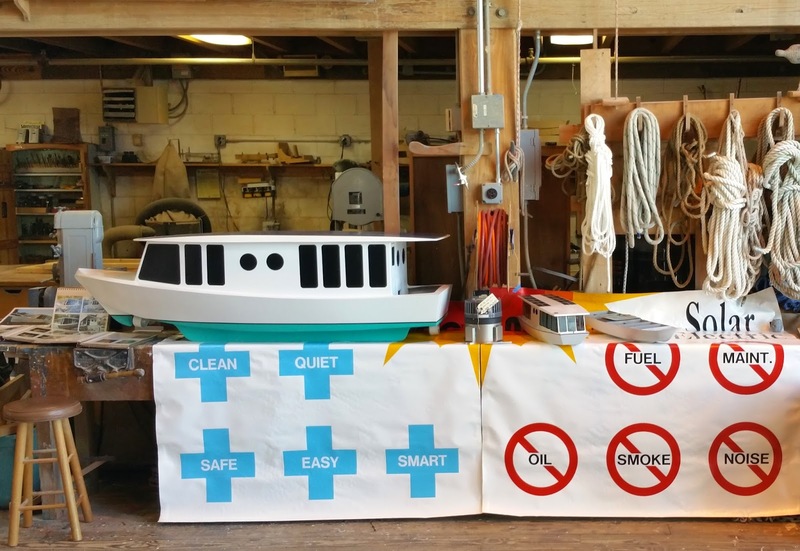 The totally solar electric powered yacht was washed and prepared on April 17th for the Cape Fear Community College annual Boat Show. The weather was quite cloudy with projections for rain. The forecast was most accurate. The morning of our departure of barely 1 mile, was marred by rain and light wind. Although this was tolerable for the boat and crew it was not a good choice for MOG appearing at the CFCC Boat Show of April 18th. 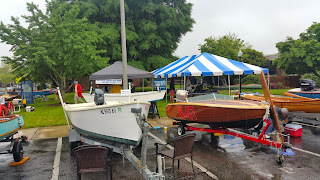 The boat show was situated on Water Street in the CFCC parking lot, close to across the street parking. Our problem was we were the only ‘in water’ boat with a location at the end of the CFCC commercial type dock and a steep aluminum access ramp to the floating dock at which we were to tie off the boat. Asking folks to walk another 1,000 feet, risking a slip on the ramp and getting soaked in the process was not the best idea. In the interest of all concerned and a modicum of safety, the CFCC gates to the docks remained locked. The MOG stayed in her slip. Out of the good number of attendees, a few people were at the show had worked on the original 30 foot MOG (before being stretched to 40 feet). Others met at the show had boats built by Nelson Silva, builder of many Simmons type skiffs and built the original MOG 30 foot version. Many folks owning T.N. Simmons’ boats were there also. T.N. Simmons is the man who made the original Simmons Sea Skiffs that were a signature craft for the sounds and rivers of the greater Wilmington area for decades. Those boat lovers that visited the show could see and touch a wide variety of very fine wooden boats, most of which were built locally, including the MOG. 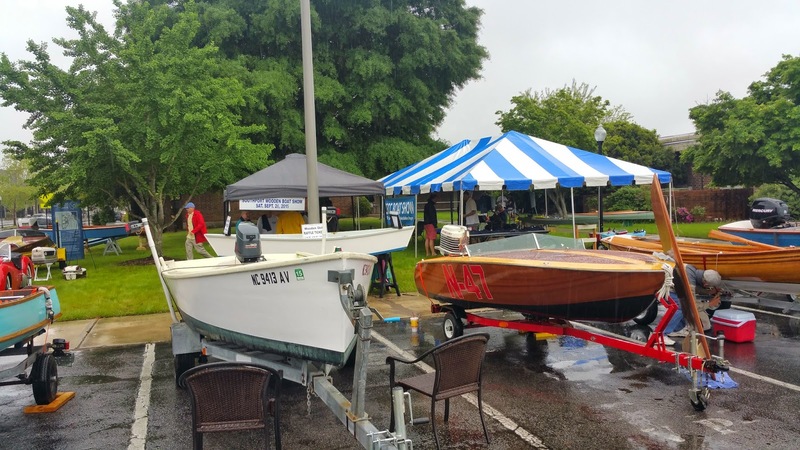 We have done the CFCC show a number of times in fair weather with other great wooden boats at their floating dock, it just was not in the weather forecast for this year. Pictures below should redisplay enlarged when 'clicked' upon. Stretched along Water St. in Wilmington, NC wooden gems sparkled in the rain. The boats trailered to the show were lining the lawn and the whole parking lot with a few small pop up tents. 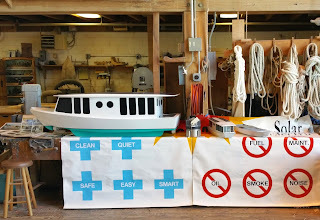 There were a number of displays for safe boating, not to mention the boatbuilding school and marine power classrooms were open for the visiting public with boat and engine work in progress. A pram bowed boat with a knotted fender starts this row of boats. Two boats shown were quite a contrast to each other yet both shared the common heritage of fine wood boat building. Runabouts, canoes, row boats, sculls, cold molded flats boats, plus sailboats were all dressed for the day. Many young boaters have started their boating experience in a wooden row boat, then progressed to a sleek runabout. No doubt the show was a success and just an hour before closing the Sun came out. At that time the whole show came to life and catered well to those who had been pent up at home or in the town restaurants. A burst of humanity seeking an educational saunter through maritime history. On Saturday, May 2nd Beaufort, North Carolina Maritime Museum opened its 41st annual Boat Show at the Harvey W. Smith Watercraft Center (waterside venue) and the NC Maritime Museum across the street. At the Watercraft Center we set up a six foot model of a version of the current 40 foot totally solar electric powered yacht. Along with the model were displayed early small test models that were used to determine the scantlings, planking and hull fitment. An eCycle electric motor of just over 14 pounds was placed in the hands of the many show goers who then gasped at the light weight for a 10 horsepower motor. Near the center of this picture is the diminutive 10 hp eCycle electric motor. The weather was a balmy sunny 70's with gentle winds, a perfect breeze drifting through the Watercraft Center hall, continuing through to impart its momentum into the sheets of sailboats ferrying ticket holders for rides in the waterside channel outside. spilled over to the streets lined with an abundance of wooden marine craft. There were literally blocks of fine craft to see on the street, various side lots and of course inside the Maritime Museum itself. A large display of well crafted model boats were lined up along long tables within a meeting room inside the museum. These were to be voted upon by the onlookers with awards at the end of the day. 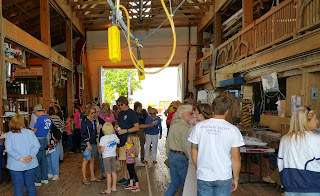 Within the Watercraft Center, many displays from antiques to ships-in-a-bottle and popcorn to go, kept young and old circulating through the wood timbered building. Even more inspiring were the antique outboard motors from the 1920s into the 1960s that were clamped about the length of the main beams of the long hall. The maritime craftwork of masters of model making such as William (Bill) Kay were displayed and commented on by the likes of Bill and wife Jean. I was literally left speechless when Jean Kay showed me a picture of a boat which had a name spelled in a manner I could not pronounce as a child. I had very fond memories of some days work on the boat I had called the Vanilla. Somehow, the big hearted crew allowed this kid to wash the decks of the boat I was to later learn to pronounce as the Valhalla. Bill had built several of the incredibly detailed models for crew members and those who desired to revisit their great times spent in Wrightsville Beach, NC around the 1950s. The flood of memories was massively intense upon seeing the actual models. Then, a bit later, I swapped stories with one of the Valhalla's crew members who had commissioned a model for the talented hands of Bill Kay to build. The detail is utterly fabulous but I will let the pictures below do the talking. William (Bill) Kay in black garb conversing with an admirer of his work. I cannot say enough about how wonderful the boat show was and great a thrill to attend. I met so many knowledgable boaters and those interested in starting into boating. In the past I had the thirty foot MOG at this same facility for some show and tell and look forward to getting back to it next year with the 40 foot MOG Algemac II. 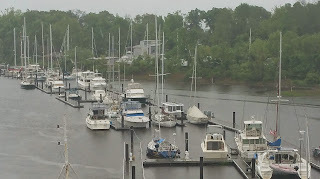 Both the mid April Wilmington, NC CFCC boat show and the early May Beuafort Boat Show should be on your agenda. The shows are friendly, informative and near to some of the best dining and sightseeing the east coast has to offer.